Located in the far south-western corner of the country, Balzers is most renowned for its Burg Gutenberg, a 12th century castle teetering on a rocky hill over the centre of town. But it's also well-known for its two ornate chapels – the Chapel of St. Peter and the Chapel of Mariahilf. There are also beautiful chapels to be found elsewhere in Liechtenstein. Perhaps the best of the bunch are the beautiful 9th century St Mamerten chapel in the old part of the village in Triesen (renowned for its 14th century tower steeple) and the Chapel of St Joseph in Planken. A must-see for ski lovers, this museum (www.skimuseum.li) explores the sport's long history. Former ski racer Noldi Beck has gathered more than 1,000 exhibits taking in a century of ski history, from 1920s ski-bending appliances to trophies from contemporary ski competitions. Liechtenstein is a skier's haven. Ski at Malbun (1,600m/5,250 ft) and Steg (1,300m/4,250 ft). At Malbun, there are several ski lifts and a natural ice rink. Steg has a sledge run as well as its famous cross-country skiing loop with three distances (4 km/2.5 miles, 12 km/7 miles and 12.5 km/7.8 miles). Actually two sets of castle ruins, most visitors climb up to the Obere Burg (Upper Castle) for a glimpse of history and a spectacular panorama. Originally built in 1250, then extended over a century, today the castle ruins are popular spots for local medieval festivals and recreations. Founded in 2000, the Kunstmuseum (www.kunstmuseum.li) is the national art gallery, and focuses on international contemporary art. Housed in an eye-catching modernist black cube in central Vaduz, the collection takes in art from the 19th century right up to the modern day. Artists featured include Rembrandt, Rubens and Van Dyck. Founded in 1930, this exhibition – one part of the Liechtenstein National Museum – tells the story of Liechtenstein's postal service throughout the country's history. The main focus is the series of postage stamps issued by the Principality since 1912, including original designs, test prints and needle plates, though the historical postal service equipment are also highlights. 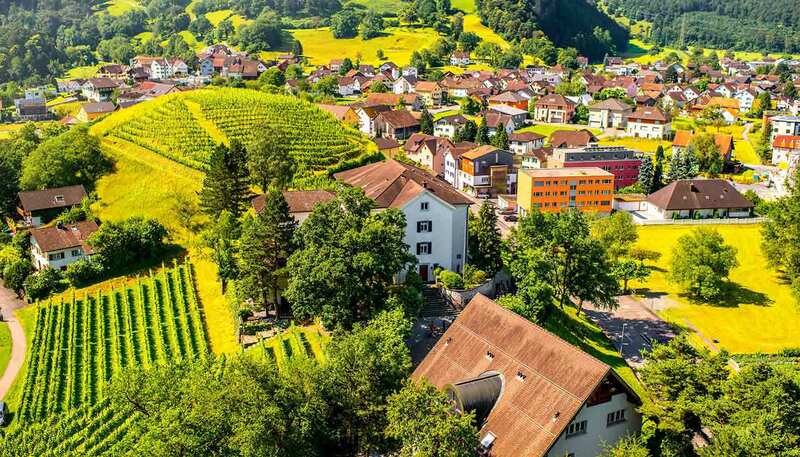 As well as means of transport, cycling is a popular recreational sport in Liechtenstein, so why not cycle in the valleys and lower-lying areas of the country? There are 96 km (56 miles) of cycling trails on both sides of the River Rhine. Mountain bikers may also use the hiking trails. Schaan is Liechtenstein's largest municipality and boasts several tourist attractions. Local highlights include the St Maria zum Trost Chapel, DoMus cultural centre and a series of Roman excavations. Schaan also boasts some of the best restaurants and bars in the country. Those who want to see the country from a new perspective can also paraglide through the mountains of Liechtenstein – and beyond. For experienced paragliders, there are several launchpads across the country, while beginners can try a taster course with an experienced instructor, including a tandem flight. There are plenty of hiking opportunities in Liechtenstein, and you will find hiking maps at the tourist office in Vaduz. One of the most famous hikes is from Gaflei, at 1,500m (4,920ft). This is the starting point for the Fürstensteig – a winding path along the high ridge that divides the Rhine and Samina valleys. Discover the country's long viticultural history on a tour of the Prince's Wine Cellars in Vaduz (www.hofkellerei.li). Visitors can take a tour, which includes a walk through the vineyards, which are perfect for growing Pinot Noir and Chardonnay, a stroll through the atmospheric basement and the chance to try a range of princely wines. Wonder at the Liechtenstein royal family home and the capital's most renowned landmark, Vaduz Castle. The original keep was built in the 12th century, but it was extended in the 16th and 17th centuries to become the impressive structure that today looms high above Vaduz. In a building that dates back to 1438, which has previously been a royal tavern, a customs house and a government building, is this fascinating national museum. There are hundreds of artefacts on display in the permanent exhibition here, including royal crowns, natural history specimens and nationalist paintings.